Ever since Emma Pierce read Pride and Prejudice, she’s been in love with Mr. Darcy and has regarded Jane Austen as the expert on all things romantic. So when it turns out that what her boyfriend Blake wants is more of a hook-up than a honeymoon, Emma is hurt, betrayed, and furious. She throws herself deeper into her work as CMO of Kinetics, only to find her job threatened when her boss brings in a consultant to help her expand the business to the East Coast. Her frustration turns to shock when that consultant turns out to be Blake’s younger brother, Lucas. Emma is determined not to fall for Lucas, but as she gets to know him, she realizes that Lucas is nothing like his brother. He is kind and attentive and spends his time and money caring for the less fortunate. But as perfect as Lucas seems, he clearly has his secrets. After all, there’s an angry woman demanding money from him and a little girl who Lucas feels responsible for. Realizing that her love life is as complicated as anything Jane Austen could have dreamed up, Emma must figure out the truth—and soon—if she wants any hope of writing her own “happily ever after” ending. What a fun book. I'm not sure if I've read anything by this author before, but I am hooked. She had such a fun, witty, laugh-out-loud writing style. The main character in the book, Emma, is a strong, independent person, but she's also got a vulnerability to her that makes her all the more likeable. Her friend Silvia was the kind of best friend that I would love to have (I feel like I've said this a few times before, but it is just as true this time.) Really, I enjoyed getting to know all of the main characters in the book. For me, what makes a story great is the ability of the author to make you feel like you really know all the people. The relationship took a long time in coming, but with the story line the way it was, it didn't feel like things were unnecessarily dragging on. I'm very happy with how things ended up, for all parties involved. 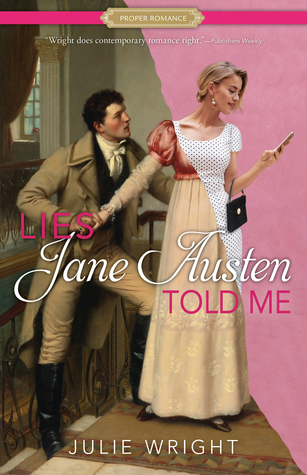 Lies Jane Austen Told Me is a cute book and a fun read. The meshing of the old and new images on the cover is a perfect fit for this story. I liked the characters and the depth the author gave them. Emma had to deal with feelings of inadequacy and betrayal both in her personal life and on the job. Lucas was a great leading man. Family meant the world to him, and his loyalty was impressive (even at the expense of his own happiness). I read this very quickly, and I'm looking forward to reading it again. It has a sweet and happy ending. First of all, the title is totally catching. We never talk much about titles, but I've decided that I rely a lot on the title to tell me about the book. This time it did not disappoint. It's a fun title for a fun book, and it totally relates to the story, which is another bonus. I will admit that as I first got into the story I was a little worried about there being a love triangle. I really really don't like love triangles, but this wasn't really one and I can't explain that anymore without giving something away, so if you don't like love triangles, just trust me. This isn't one, and it works. All of the characters, from the main ones to the supporting ones, are very well written and completely believable. I liked the way Emma related to, and handled, her co-workers. It showed a lot about her character, and her inner dialogue showed us the faults she had. Some she recognized, and some she only came to realize later. I would read this again (already have in fact) and I can't wait to recommend it to by book reading friends.